Voting in the second phase will be held in 95 parliamentary constituencies across 12 states and 1 Union territory on April 18. Polling will be held in 37 seats in Tamil Nadu, 14 seats in Karnataka, 10 in Maharashtra, eight in Uttar Pradesh, five each in Assam, Bihar and Odisha, three each in Chhattisgarh and West Bengal, two in Jammu and Kashmir and one seat each in Manipur and Puducherry. While the election in Vellore has been cancelled following an EC order over allegations of excess use of money power, election in one seat in Tripura which was scheduled to be held on April 19 has been postponed to April 23 over law and order concerns. Authorities in Vellore had seized over Rs 10 crore cash from the premises of an associate of a DMK leader recently. Elections will also be held in 35 assembly constituencies in Odisha. Major parties which currently hold these seats are Bharatiya Janata Party and the All India Anna Dravida Munnetra Kazhagam (AIADMK) with 27 and 37 seats each. The election will be crucial for the AIADMK as this is the first Lok Sabha poll that is happening after the death of former party chief J Jayalalithaa. Of the seats going to polls, the BJP is in power in eight seats of Uttar Pradesh, six seats in Karnataka, 4 seats in Maharashtra, 2 seats of Assam, 3 seats of Chhattishgarh, one seat each in Jammu and Kashmir, Odisha, Tamil Nadu and West Bengal. The Congress is in power in 12 of these 95 seats. These include 6 seats in Karnataka, 2 each in Assam, Maharashtra and one each in Bihar and Manipur. In teh Bihar Kishanganj seat, Mohammad Asrarul Haque who won the last election died in December 2018. Among the key contestants in the fray are Union ministers Jual Oram, Sadananda Gowda and Pon Radhakrishnan, former prime minister HD Deve Gowda, Congress leaders Verappa Moily and Raj Babbar, National Conference president Farooq Abdullah, BJP’s Hema Malini and DMK’s Dayanidhi Maran, A Raja and Kanimozhi. 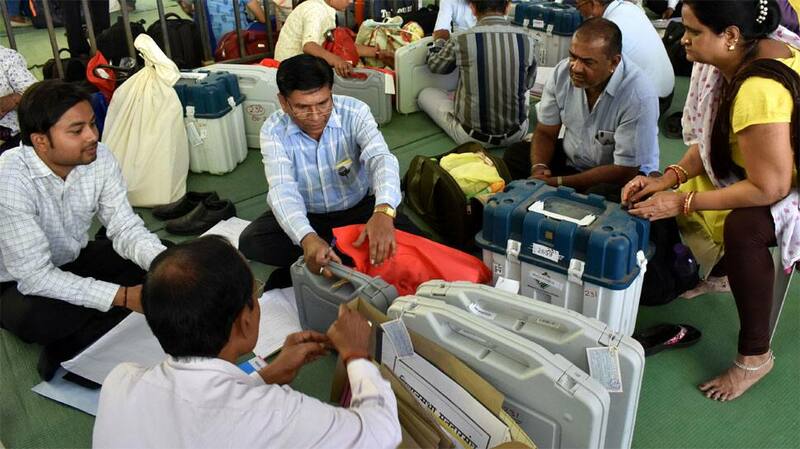 The Lok Sabha polls are being held in seven-phases for 542 seats (barring Vellore) on April 11, April 18, April 23, April 29, May 6, May 12 and May 19, and counting will be on May 23.